The proverb ‘Time and tide wait for no man’ is first credited in another form to St. Maher in 1225, but we all get the point that time is marching on and none of us can stop it. To me, it seems like only yesterday that we were celebrating the new millennium with many brilliant displays seen on TV from all over the world. One of the first to appear when the clock chimed twelve was Australia, and the Sydney Harbour Bridge. 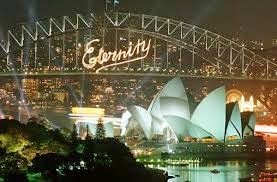 Amidst the illuminations on the Bridge the word ETERNITY stood out in bold copperplate writing, a replica of the word that Arthur Stace wrote on the pavements of Sydney for over thirty-five years. Who was Arthur Stace? According to Wikipedia ‘Arthur Malcolm Stace (9 February 1884 – 30 July 1967), otherwise known as Mr Eternity, was an Australian reformed alcoholic who converted to Christianity and spread his form of gospel by writing the word "Eternity'" in chalk on footpaths in Sydney over a period of approximately 35 years. Stace was born in Balmain, in the inner-west of Sydney. The child of alcoholics, he was brought up in poverty. In order to survive, he resorted to stealing bread and milk and searching for scraps of food in bins. By the age of 12, Stace, with virtually no formal schooling, had become a ward of the state. As a teenager, he became an alcoholic and was subsequently sent to jail at 15. Afterwards, he worked as a "cockatoo" or a look-out for a Two-up "school". In his twenties, he was a scout for his sisters' brothels. In March 1916, at age 26, he enlisted for World War I with the 19th Battalion 5th Brigade AIF, entering with the 16th Reinforcements, service number 5934. He suffered recurring bouts of bronchitis and pleurisy, which led to his medical discharge on 2 April 1919. Stace converted to Christianity on the night of 6 August 1930, after hearing an inspirational sermon by the Reverend R. B. S. Hammond at St. Barnabas Church, Broadway. Inspired by the words, he became enamoured of the notion of eternity. Two years later, on 14 November 1932, Arthur was further inspired by the preaching of evangelist John G. Ridley, MC on "The echoes of Eternity" from Isaiah 57:15:"For thus saith the high and lofty One that inhabiteth Eternity, whose name is Holy; I dwell in the high and holy place, with him also that is of a contrite and humble spirit, to revive the spirit of the humble, and to revive the heart of the contrite ones." John Ridley's words,"Eternity, Eternity, I wish that I could sound or shout that word to everyone in the streets of Sydney. You've got to meet it, where will you spend Eternity?" proved crucial in Stace's decision to tell others about his faith. 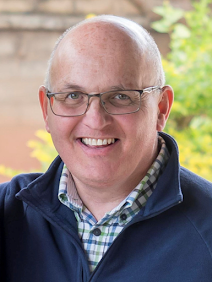 In an interview, Stace said, "Eternity went ringing through my brain and suddenly I began crying and felt a powerful call from the Lord to write Eternity." Even though he was illiterate and could hardly write his own name Arthur, legibly, "the word 'Eternity' came out smoothly, in a beautiful copperplate script. I couldn't understand it, and I still can't." The Sydney City Council brought him to the attention of the police as they had rules about the defacing of pavements, so much so that he narrowly avoided arrest around twenty-four times. Each time he was caught, he responded with, "But I had permission from a higher source". Several mornings a week for the next 35 years, Stace left his wife, Pearl and their home in Bulwarra Road, Pyrmont around 5am to go around the streets of Sydney and chalk the word "Eternity" on footpaths, train station entrances and anywhere else he could think of. It is estimated that he wrote the word around 500,000 times over the 35 years. Workers arriving in the city would see the word freshly written, but not the writer, and so, "The man who writes Eternity" became a legend in Sydney. The mystery was solved when Reverend Lisle M. Thompson, who preached at the church where Stace worked as a cleaner, saw him take a piece of chalk from his pocket and write the word on the footpath. Thompson wrote about Stace's life and an interview was published in the Sydney Sunday Telegraph on 21 June 1956’. Arthur Stace left his mark upon Sydney and all the world with the word ‘Eternity’. Eternity, like God Himself has no beginning and no end. The word eternity is found only once in the Bible (Isa. 57:15) quoted above but the word eternal is found 47 times (twice in Old Testament and 45 in the NT) 21 of these present the fact of eternal life, and John’s writings have 15 of these. 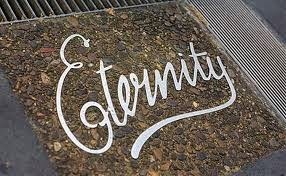 ‘Eternal’ and ‘everlasting’ in those verses are the same Greek word so can be interchangeable. Christ’s death on the cross is the only way to obtain eternal life and faith in Him is the only means of receiving it, for sinners like you and me. John Ridley’s words, "Eternity, Eternity, I wish that I could sound or shout that word to everyone in the streets of Sydney. You've got to meet it, where will you spend Eternity?" were aimed locally, but they apply globally. Have you got eternal life? If not, then before you do anything else, tell God about your sin and ask His forgiveness. He will save you and give you eternal life. God bless.